It is my theory that most bands have a creative shelf life, a period of no more than 4 or 5 albums where they are able to create pieces of art that build to a career defining great album. And then, as a direct result of that great album, bands will either split up in a hate fuelled vat of legal nastiness or will spend the rest of their career striving to re-create that one great album before falling into being a derivative cabaret version of themselves. A genre that shows that theory, in relation to bands trying to re-create the great album, would be the Cool Britannia of 1990’s guitar rock pop bands, Britpop itself. Just look at Noel Gallagher for instance, who, for me, hasn’t created an original album, either in Oasis or as part of his High Flying Birds since 1998. And for every Oasis there is also a Pulp or Suede, bands who had their moment and then went their separate ways only to reform years later to perform, albeit exceptional, greatest hits tours and concerts. 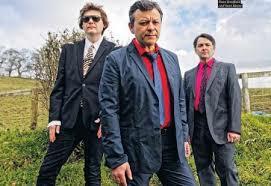 The Manic Street Preachers are, however, one band, who buck those trends and who have forged a career, built on the back of their magnificent great album, Everything Must Go, of original, creative and brilliant albums. 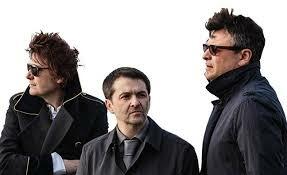 Released in April their thirteenth studio album, Resistance Is Futile, is firmly another slice of Manics majesty. An album full of wonderful guitar driven melodies, underpinned by lush orchestrations that are beautifully produced, with a poetry of anger, love, spirit and determination that drive messages to the listener. These are songs that are rewarding, evocative and quite simply fantastic. What sets the Manics apart from their contemporaries is exactly that unwillingness to compromise, to try and sell another version of Everything Must Go to adoring devotees. They are a band confident enough to say to those fans this is what we want to do, we are proud of it and we think you’ll like it. But if you don’t, so what, its your loss not ours. And its that lack of commercial ambition that makes their albums successful; its the attitude they put into their art that makes it such a powerful work. But that’s not to say they won’t make nods to previous works. Musically they do what they do very well and lyrically they will challenge and tackle subjects both dear to their hearts and which you wouldn’t normally associate with pop songs, Liverpool Revisited, for instance, a song in remembrance of the 96 fans who lost their life at Hillsborough but which also commemorates the bravery and determination of those who fought, and continue to do so, for justice. As ever, James, Nicky and Sean, have crafted another perfect album of light and shade; the contrasts between songs of love, anger and defiance compliment each other. It is an album produced, by Dave Eringa, with a knowing and understanding hand. Its just the right length, it gets across its messages and is framed by beautiful and wondrous melodies, but whilst also giving full exposure to angry crashing riffs, distinctive sub-shouty vocals, which James Dean Bradfield delivers with his trademark anger, and a driving rhythm set by the bass of Nicky Wire and drums of Sean Moore. 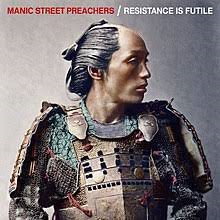 In a world where defiance is needed more than ever the Manics have again proven themselves to be leaders in intelligent and creative rock pop music. And, again, a certain contender for album of the year. Saw them last night at Wembley. Definitely no resting on their laurels. Indeed Monty – a band never content to wallow in self congratulatory stupor!